The best-selling collection of simple, seasonal recipes for the foods of the Greek Islands from a Julia Child Award�winner, available for the first time in paperback. 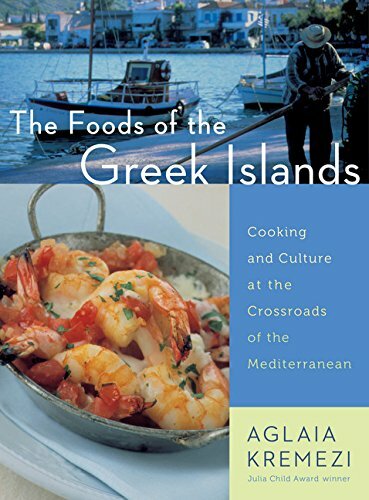 In this book, called by Time �the next best thing to a cruise through the Greek islands,� Aglaia Kremezi showcases the fresh, uncomplicated recipes�many of them vegetarian�that she collected from local women, fishermen, bakers, and farmers. Like all Mediterranean food, these dishes are light, simple, and feature seasonal produce, fresh herbs, and fish. Passed from generation to generation by word of mouth, most of these recipes have never before been written down. All translate easily to the American home kitchen: Finger-Sized Fried Greens Pies; Onion, Tomato, and Feta Turnovers; Cod with Artichokes. Filled with lush photographs and stories of island life, The Foods of the Greek Islands is for all cooks and travelers who want to experience this diverse and deeply rooted cuisine firsthand.